A Year of Being Here: Mark J. Mitchell: "Samsara Sestina"
Is the ordinary still there? The ordinary is still there too. With beauty. But that’s not the same thing. It within, learn it and let it out. Boundary? How does it become real? Where is the rock when it’s no thing? Or another step in the dance? Of shiny sad things that you may touch but never take. "Samsara Sestina" by Mark J. Mitchell. Text as published in Numinous: Spiritual Poetry (January, 2012). 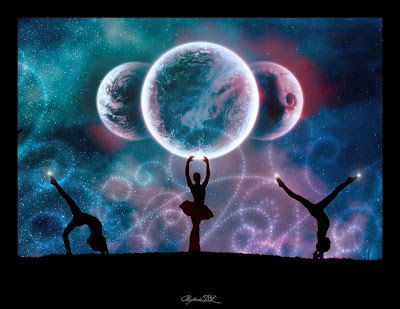 Art credit: "Cosmic Dance," digital art by mysteria-dl.